Engineers at Toshiba Corporation in Tokyo, Japan have announced a new 128 GB Flash memory package, the highest capacity Flash memory chip ever created. Composed of 16 individual 8GB NAND chips with a controller in a single package, the new memory package should be in limited production by September 2010 and in mass production for wide use by the end of the year. Using new thinning and layering techniques including 32 nanometer process technology, Toshiba was able to create individual chips that are only 30 micrometers thick and combine the full suite of 16 chips plus a controller into a 237 ball FBGA package that’s only 17 millimeters wide by 22 millimeters long by 1.4 millimeters thick. This small size makes the package a viable choice for small devices such as mobile phones, digital cameras, and mp3 players as well as for portable memory devices. It is particularly well suited for digital video; 128 GB equates to almost 17 hours of recorded high definition video. The new memory package is fully compliant with the JEDEC e MMC v4.4 interface, which simplifies system development by providing industry standard driver software, error handling and correction, and write block management. Low level code written for other memory packages using this standard should work without significant modification, lowering development time and costs. Write speeds should reach as high as 21 MB per second with read speeds up to 46 MB per second in an Interleave mode and 55 MB per second in a non-Interleave mode. 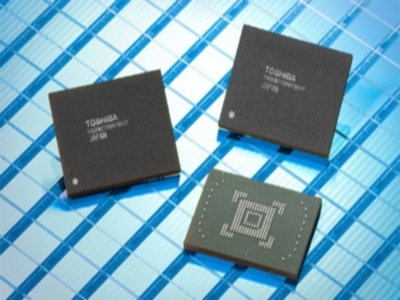 In addition to the planned 128 GB memory package, Toshiba is also releasing a new 64 GB memory package using the same controller, thinner chips, and packaging. The 64 GB version should be available on a limited basis in August 2010 with full mass production scheduled by the end of the year. TFOT has previously reported on other memory cards and memory formats including the previously released 32 GB Toshiba memory package, new methods for fabricating Flash memory chips which could double chip capacity, a way to stack memory cells to increase capacity without significantly increasing chip size, and the new SDXC memory format capable of supporting up to 2 TB of data in an SD card format. Read more about the new Toshiba memory packages in this press release.